A chemical compound is a chemical substance composed of many identical molecules (or molecular entities) composed of atoms from more than one element held together by chemical bonds. A chemical element bonded to an identical chemical element is not a chemical compound since only one element, not two different elements, is involved. certain complexes held together by coordinate covalent bonds. A chemical formula is a way of expressing information about the proportions of atoms that constitute a particular chemical compound, using the standard abbreviations for the chemical elements, and subscripts to indicate the number of atoms involved. 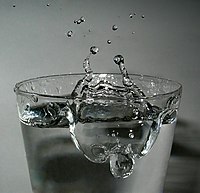 For example, water is composed of two hydrogen atoms bonded to one oxygen atom: the chemical formula is H2O. Many chemical compounds have a unique numerical identifier assigned by the Chemical Abstracts Service (CAS): its CAS number. A compound can be converted to a different chemical composition by interaction with a second chemical compound via a chemical reaction. In this process, bonds between atoms are broken in both of the interacting compounds, and then bonds are reformed so that new associations are made between atoms. Any substance consisting of two or more different types of atoms (chemical elements) in a fixed stoichiometric proportion can be termed a chemical compound; the concept is most readily understood when considering pure chemical substances. :15  It follows from their being composed of fixed proportions of two or more types of atoms that chemical compounds can be converted, via chemical reaction, into compounds or substances each having fewer atoms. The ratio of each element in the compound is expressed in a ratio in its chemical formula. A chemical formula is a way of expressing information about the proportions of atoms that constitute a particular chemical compound, using the standard abbreviations for the chemical elements, and subscripts to indicate the number of atoms involved. For example, water is composed of two hydrogen atoms bonded to one oxygen atom: the chemical formula is H2O. In the case of non-stoichiometric compounds, the proportions may be reproducible with regard to their preparation, and give fixed proportions of their component elements, but proportions that are not integral [e.g., for palladium hydride, PdHx (0.02 < x < 0.58)]. Chemical compounds have a unique and defined chemical structure held together in a defined spatial arrangement by chemical bonds. Chemical compounds can be molecular compounds held together by covalent bonds, salts held together by ionic bonds, intermetallic compounds held together by metallic bonds, or the subset of chemical complexes that are held together by coordinate covalent bonds. Pure chemical elements are generally not considered chemical compounds, failing the two or more atom requirement, though they often consist of molecules composed of multiple atoms (such as in the diatomic molecule H2, or the polyatomic molecule S8, etc.). Many chemical compounds have a unique numerical identifier assigned by the Chemical Abstracts Service (CAS): its CAS number. There is varying and sometimes inconsistent nomenclature differentiating substances, which include truly non-stoichiometric examples, from chemical compounds, which require the fixed ratios. Many solid chemical substances—for example many silicate minerals—are chemical substances, but do not have simple formulae reflecting chemically bonding of elements to one another in fixed ratios; even so, these crystalline substances are often called "non-stoichiometric compounds". It may be argued that they are related to, rather than being chemical compounds, insofar as the variability in their compositions is often due to either the presence of foreign elements trapped within the crystal structure of an otherwise known true chemical compound, or due to perturbations in structure relative to the known compound that arise because of an excess of deficit of the constituent elements at places in its structure; such non-stoichiometric substances form most of the crust and mantle of the Earth. Other compounds regarded as chemically identical may have varying amounts of heavy or light isotopes of the constituent elements, which changes the ratio of elements by mass slightly. Compounds are held together through a variety of different types of bonding and forces. The differences in the types of bonds in compounds differ based on the types of elements present in the compound. London dispersion forces are the weakest force of all intermolecular forces. They are temporary attractive forces that form when the electrons in two adjacent atoms are positioned so that they create a temporary dipole. Additionally, London dispersion forces are responsible for condensing non polar substances to liquids, and to further freeze to a solid state dependent on how low the temperature of the environment is. A covalent bond, also known as a molecular bond, involves the sharing of electrons between two atoms. Primarily, this type of bond occurs between elements that fall close to each other on the periodic table of elements, yet it is observed between some metals and nonmetals. This is due to the mechanism of this type of bond. Elements that fall close to each other on the periodic table tend to have similar electronegativities, which means they have a similar affinity for electrons. Since neither element has a stronger affinity to donate or gain electrons, it causes the elements to share electrons so both elements have a more stable octet. Ionic bonding occurs when valence electrons are completely transferred between elements. Opposite to covalent bonding, this chemical bond creates two oppositely charged ions. The metals in ionic bonding usually lose their valence electrons, becoming a positively charged cation. The nonmetal will gain the electrons from the metal, making the nonmetal a negatively charged anion. As outlined, ionic bonds occur between an electron donor, usually a metal, and an electron acceptor, which tends to be a nonmetal. Hydrogen bonding occurs when a hydrogen atom bonded to an electronegative atom forms an electrostatic connection with another electronegative atom through interacting dipoles or charges. A compound can be converted to a different chemical composition by interaction with a second chemical compound via a chemical reaction. In this process, bonds between atoms are broken in both of the interacting compounds, and then bonds are reformed so that new associations are made between atoms. Schematically, this reaction could be described as AB + CD → AD + CB, where A, B, C, and D are each unique atoms; and AB, AD, CD, and CB are each unique compounds. ^ "Chemical compound". ScienceDaily. Archived from the original on 2017-09-13. Retrieved 2017-09-13. ^ a b Atkins, Peter; Jones, Loretta (2004). Chemical Principles: The Quest for Insight. W.H. Freeman. ISBN 978-0-7167-5701-6. ^ "London Dispersion Forces". www.chem.purdue.edu. Archived from the original on 2017-01-13. Retrieved 2017-09-13. ^ "Ionic and Covalent Bonds". Chemistry LibreTexts. 2013-10-02. Archived from the original on 2017-09-13. Retrieved 2017-09-13. ^ "Hydrogen Bonds". chemistry.elmhurst.edu. Archived from the original on 2016-11-19. Retrieved 2017-10-28. ^ "Hydrogen Bonding". www.chem.purdue.edu. Archived from the original on 2011-08-08. Retrieved 2017-10-28. ^ "intermolecular bonding – hydrogen bonds". www.chemguide.co.uk. Archived from the original on 2016-12-19. Retrieved 2017-10-28. Wikimedia Commons has media related to Chemical compounds. This page was last edited on 11 April 2019, at 01:14 (UTC).